Have you been brunching too much lately? Are you sick of feeling too full after an indulgent day of brunching (but no regrets amiright)? 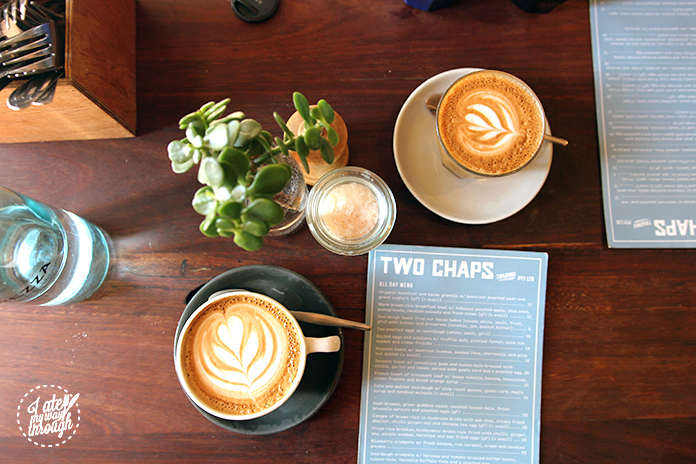 Well, wake yourself from your food coma and make your way down to Two Chaps in Marrickville where this humble café awaits patiently for you to sit down (and be humble). 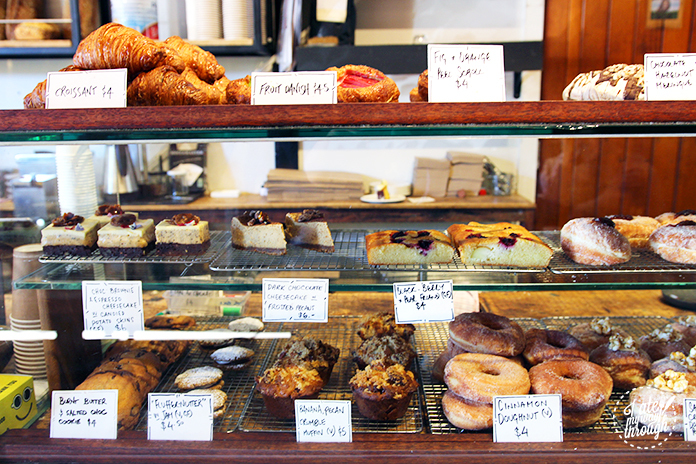 Two Chaps has an evolving menu that focuses on local and seasonal produce. Did we also mention that their entire menu is vegetarian? 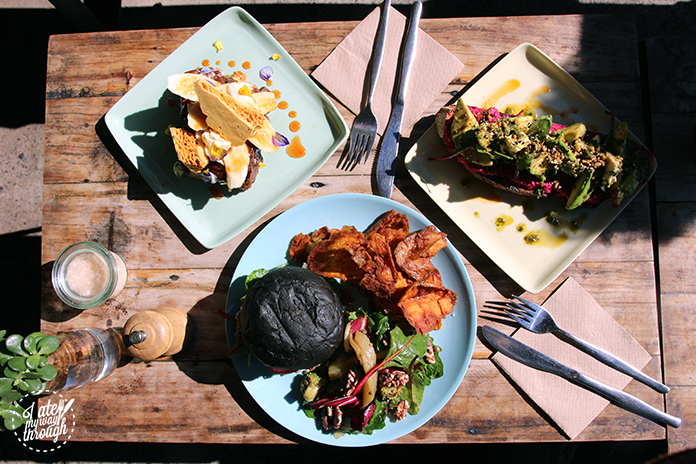 So those with and without dietary requirements can enjoy any dish from the menu whilst soaking up the morning sun. To top it off, all the bread and pastry are made daily by hand to ensure that your experience with carbohydrates at Two Chaps will never disappoint. With drool hanging out of our mouths, we scanned the menu with hawk-like eyes. If we could’ve, we would’ve ordered five dishes each, but our stomachs (and our mums) would’ve said no. We ended up ordering three dishes. First things first, coffee. 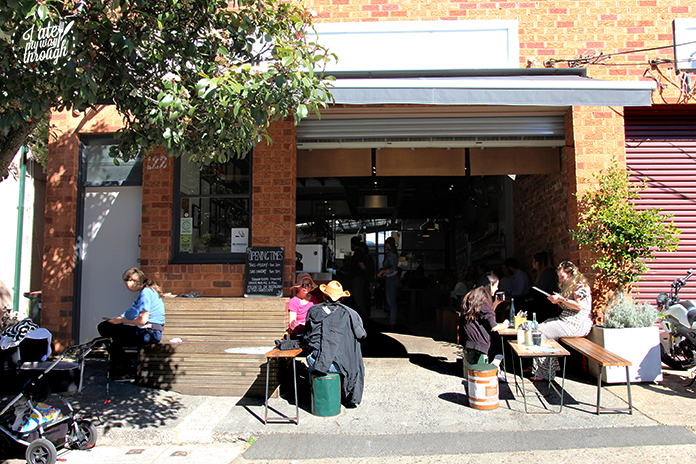 Two Chaps gets their coffee roasted by The Blind Coffee Roaster which is also located in Marrickville. Two Chaps loves supporting local and sustainable producers, so you know you’re assisting the local community when you visit the café. We ordered a skim latte and a skim cappuccino ($4 each). Velvety smooth coffee is always the way to go. 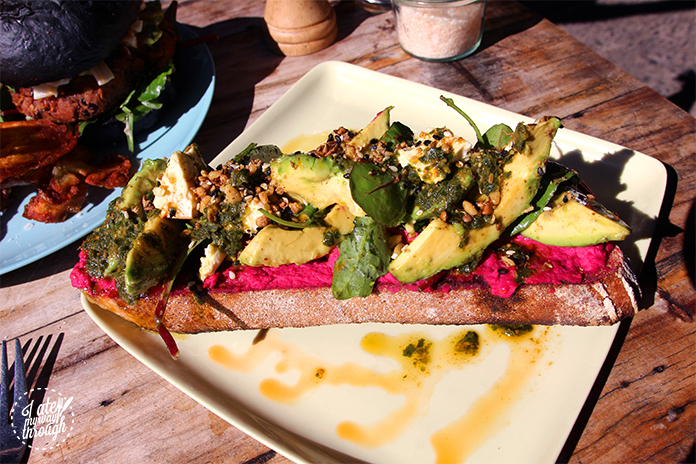 The first dish we dug into was the Avocado toast with beetroot hummus, smoked feta, chermoula, and pine nut dukkah ($16). This vibrant little dish looked and tasty extremely healthy and delicious. My personal favourite aspect of this dish would’ve been the beetroot hummus. You always come across alternative versions of hummus, but I think this beetroot hummus was the most memorable one I’ve eaten. The bright pink spread tied together the ripe avocadoes and the crusty bread with its smooth texture with a hint of citrus. The chermoula, a marinade made from spices and herbs, added a zesty touch whereas the smoked feta amplified the creaminess of the dish. The pine nut dukkah complemented the chermoula with its crunchy texture and nuttiness. The dish was finished with a drizzle of olive oil. Next in line to our stomachs was the Chipotle kidney bean burger on a charcoal brioche bun with oaxaca cheese, pickled red onion, guacamole, chiltomate and coriander seed aioli served with potato skins and salad ($20). I’m attracted to any food that is black because I feel a spiritual connection to it (and I’m always curious to see what it tastes like). So, when I read that their burger was served on a charcoal brioche bun, we had to try it. 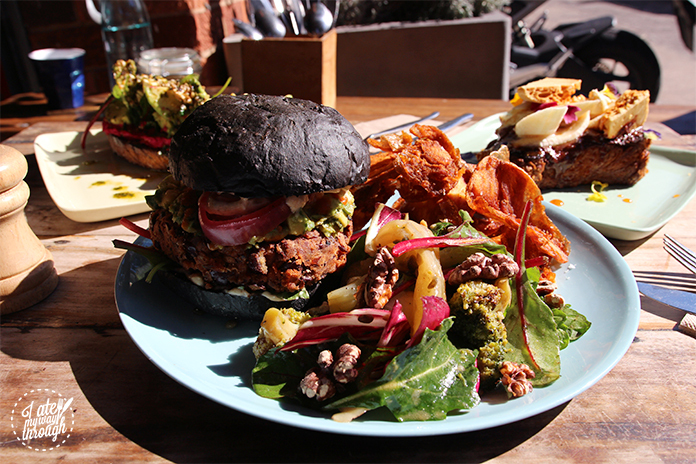 Vegetarian burgers are always a hit or miss, they are either too plain or over-complex. However, Two Chaps have managed to find a balance between a minimal yet fulfilling burger. The ingredients used are simple but in combination with one another, the burger becomes a myriad of flavours and textures. The charcoal brioche bun was fluffy on the inside and perfectly toasted on the outside. You couldn’t taste the charcoal but it was satisfying eating something that was pitch black and delicious. The kidney bean patty was packed with protein, a mixture of mashed and whole beans, creating a smooth texture with pockets of soft, whole beans. The oaxaca cheese, a Mexican white, semihard cheese, had a subtle milky flavour which was prominent in the aftertaste. The sourness of the red pickled onions refreshed your palate with each bite of the burger. It was fresh and crisp which broke up the heavier flavours of the burger. Everything is better with avocado, so why not slap some guacamole into your burger. The potato skins were crispy and seasoned with a touch of salt. You can’t go wrong with fried potatoes. The salad was a nice refreshment in between bites with fresh greens, crunchy walnuts, broccoli and pickled vegetables. Now onto my personal favourite dish from the menu, French toast of croissant loaf with house notella, banana, honeycomb, crème fraiche and blood orange syrup ($15). 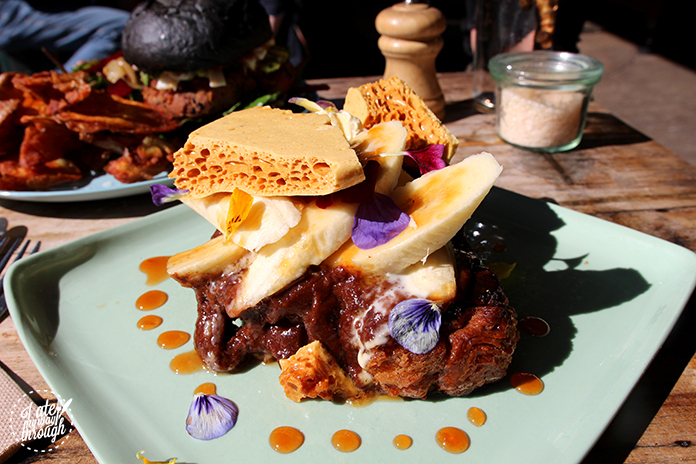 The dish was not only picturesque, but it also tasted like a sweet tooth’s wonderland. The slice of croissant loaf was buttery and when dolloped with a generous amount of notella (not Nutella), it tasted like a slice of heaven had fell to earth and landed onto your plate. The fresh slices of banana incorporated natural sweetness into the dish whereas the brittle honeycomb added crunch. The creaminess of the crème fraiche perfectly complemented the notella as its broke up rich, sweetness of the dish. If you are looking to satisfy your sweet tooth, then look no further than Two Chaps’ French toast. Spend a relaxing afternoon and indulge in food that won’t make you feel guilty about eating at Two Chaps. The café allows you to slip away from the fast-paced city street and sink into a chair whilst basking in the afternoon sun. Contrary to popular belief, Carmen is not a combination of an automobile and human males. Instead, she is a university student studying a bachelor of design and international studies. Carmen believes that the details in life are what makes life worth living and focuses on capturing these transient moments in her designs. All that Carmen wants from life is to travel, eat and inspire. During her spare time, Carmen is busy designing, looking for places to eat and coming up with excuses to go overseas. She believes that a country’s food and eating etiquette strongly reflects the culture and history of the place. 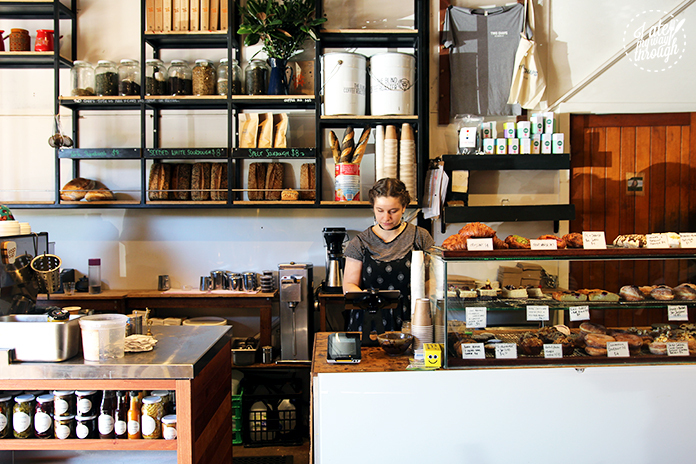 In Sydney, you will most likely find her waiting for coffee at a café. Carmen also worryingly accepts bribes that are rewarded with sushi (sashimi is also accepted).